As you may know, the Offshore Korea 2012 is held in BEXCO in Busan. Tell you what, do you know what it is? Today, in this post, I’d love to introduce BEXCO to you. 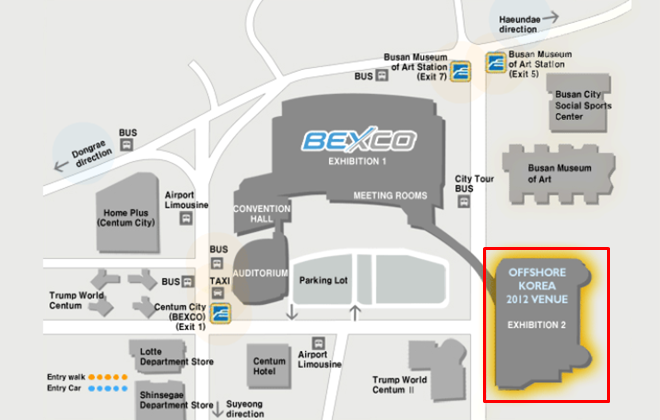 BEXCO was opened in 2001 with the aim of globalization, industrialization and informatization in Busan and Gyeongsangnam-do, which locate in the southeast of Korea. Its building is consisted 4floors from B1 to 3F and largely divided an exhibition hall, a convention hall, a multi-purpose auditorium and subsidiary facilities. In particular, approximately 1,800 booths can be installed in the exhibition hall and the exhibition spaces can be readjusted according to clients’ requests. In addition, the outdoor exhibition hall is optimum for the large-scale events. In the meantime, it is used for various performances and events. After opening, it was utilized as the spaces of the 2002 Korea – Japan World Cup group drawing and the press center during the 2002 Busan Asian Games. Apart from that, various global events, like 2005 APEC Summit and 2003 ICCA annual convention, are annually held.